Composed by Jane Bastien, Lisa Bastien, and Lori Bastien. Method. Bastien Piano Library. Primer Level piece for the Piano Solo Event with the National Federation of Music Clubs (NFMC) Festivals Bulletin 2008-2009-2010. Music Book and CD. Neil A. Kjos Music Company #WP420. Published by Neil A. Kjos Music Company (KJ.WP420). 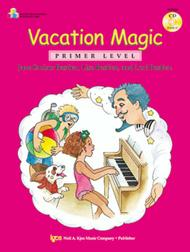 Vacation Magic is an exciting new adventure in music! Designed for students to use on their own or with a teacher, Vacation Magic is a great supplement for vacation study, no matter what method your students use. Each volume includes original solos, CD accompaniments, ear training & music appreciation activities, theory, and sight reading all woven into an engaging story line. A fun, interactive approach keeps students motivated and encourages them to become more independent learners. Whether you conduct "piano camp," teach privately, or take time off during holidays, Vacation Magic is the perfect way to keep your students excited, challenged, and learning! May 08, 2015 Audio tracks are great, great for beginners! The CD is great and it is ideal for beginners of 5 finger pianists.